A cost-effective self-priming pump that reduces energy consumption and CO2 footprint. Trimming the impeller to match the exact duty conditions lowers power requirements and installation costs. LKH Prime is up to 60% more efficient than traditional liquid ring pumps and up to 25% more efficient than other air-screw pumps – over a wider performance envelope. It operates with 80% less noise than traditional liquid ring pumps. Designed primarily for Cleaning-in-Place (CIP) duties containing entrained air, Alfa Laval LKH Prime can also pump product. Using a single pump where multiple pumps are normally required saves on capital and installation costs, and increases plant efficiency and cleanliness. Combining the air-screw with a highly efficient centrifugal impeller allows for gentle handling of sensitive product media. Alfa Laval LKH Prime is a self-priming pump based on air-screw technology. It offers excellent operational efficiency, reducing energy consumption. The pump achieves capacities of up to 70 m3/hr and pressures of up to 40 m head. 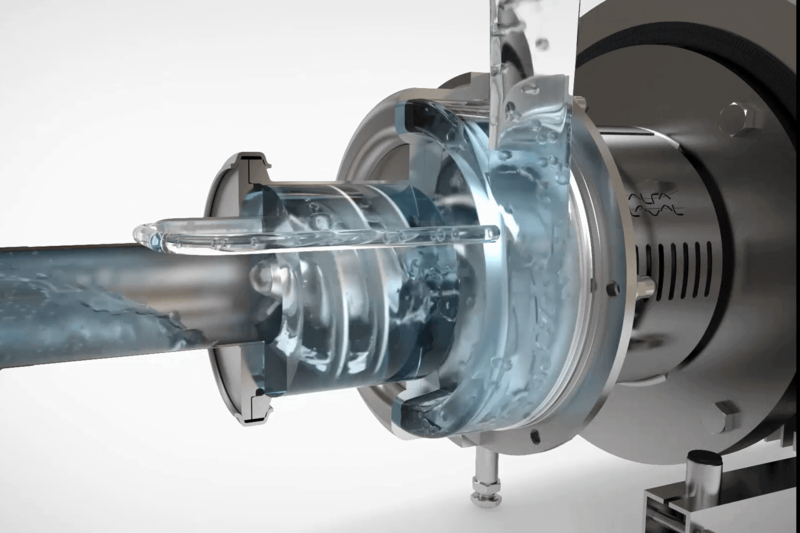 The pump shares many common components with the Alfa Laval LKH pump range including the impeller, which can be trimmed to optimize pump performance according to its application. Dedicated components include the airscrew, casing, re-circulation pipe and cover. On applications where the pumped media contains a mixture of air and liquid in the suction line, air-screw rotation causes the formation of a continuous liquid ring within the canister. Due to the eccentric position of the canister relative to the air-screw, an air chamber forms between the liquid ring and the air-screw, as shown, which separates into air pockets between the air-screw vanes. The continuous rotation of the air-screw forces air pockets through the canister into the suction stage of the impeller which are then pumped out via the discharge. Liquid is returned from the discharge via the re-circulation pipe into the canister to ensure the liquid ring is maintained at all times. When there is no air present, the canister and recirculation loop have no function and are fully filled with liquid. The liquid passes through the canister into the suction stage of the impeller, allowing the pump to act as a traditional centrifugal pump.